For anyone who uses wood as their primary or secondary source of heat, a steady supply of firewood is essential. 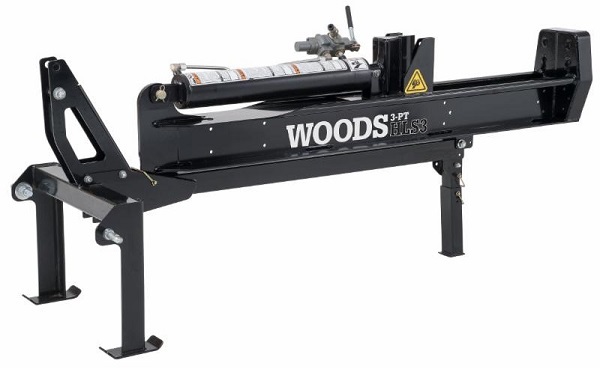 The new 3-point log splitter from Woods Equipment makes the log splitting process go smoothly. The log splitter attaches inline to Category 1 and Category 2 tractors, and can be operated in a horizontal or vertical position, to match the user’s preference or physical ability. Some operators find it easier to use the splitter in vertical position, to reduce lifting. The inline design also provides a large operator work area, offering more flexibility when loading split logs. An eight-inch wedge splits the most difficult wood cleanly, including wet, stringy elm. It will accommodate larger logs up to 24.5 in. in length, with a patented, integrated log cradle. The model HLS3 Log Splitter provides 22 tons of maximum splitting force and a 13-second cycle time. The log splitter beam is manufactured in the USA with high-strength US steel. Highest stress areas are reinforced and the beam has an interlocked footplate for extreme durability. The HLS3 beam carries a 5-year residential and 3-year commercial warranty. The log splitter offers a 2-year hydraulic component warranty. Accessories include a 4-way wedge, which increases productivity, a log catcher that helps operators work more easily and efficiently, and hose kit. All accessories are sold separately. The HLS3 3-point Log Splitter is sold exclusively through authorized Woods dealers. To find your nearest Woods dealer, visit www.woodsequipment.com. Check out more Woods Equipment news here.